What follows below is a very detailed guide. See our simplified quick start guide to installing and authorizing Live on a multi-user computer here. To get started, we recommended installing and authorizing the latest available version of Live 10. To do so, log in to your User Account and select the Live version and operating system from the drop down menus. On a Mac, Live 10 is only supported on OS X 10.11.6 and above. On Windows devices, Live 10 is only supported on Windows 7 and above. Additionally, the latest version of Live 9 (9.7.7) is not compatible with Windows XP, Windows Vista, or Mac OS X 10.6. The last version supported on those systems is Live 9.1.10. Installers of Live 9.1.10 can be downloaded from the Download Archive. When the Live 10 .dmg has finished downloading, double-click on the file. A mounted disk named 'Ableton Live 10' will appear on your desktop and open automatically. 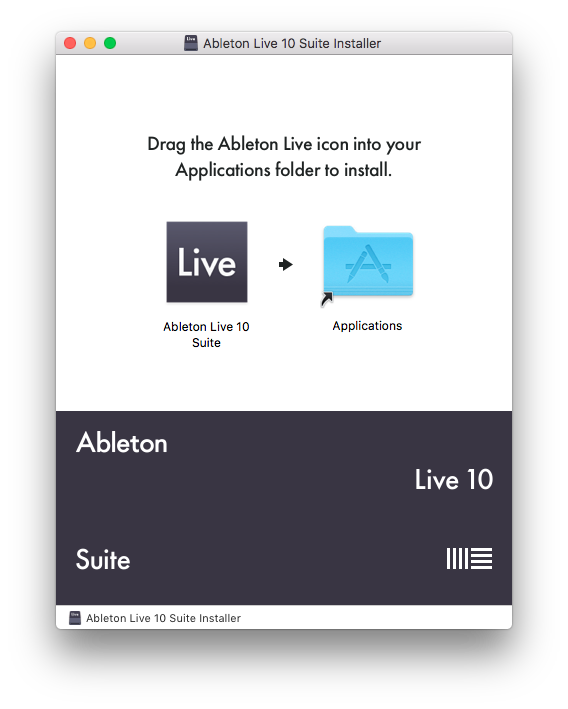 Drag the Ableton Live 10 application into your Applications folder, as shown above. Once it is finished copying, unmount the .dmg file by pressing the eject button in the Finder sidebar. Once the disk image has been unmounted, you can drag the .dmg file to the trash. To launch Live 10, open the Applications folder and double-click on the Ableton Live 10 icon. You can also drag the Ableton Live 10 icon to your dock in order to add a shortcut for launching Live. Choose "Extract All..." from the drop down menu. Then, launch the Setup.msi file by double clicking it once the file has been unpacked. The program will guide you through the steps necessary to install Live 10 on your Windows machine. Once the installation is complete, click on the Windows Start menu where you'll find the Live 10 shortcut. At this point, you can also delete the ableton_live_10.zip folder. Please follow the instructions found in the link below to authorize Live on your administrator machine. First, follow the instructions under section 2.1 to authorize Live on the classroom/lab's administrator machine. Once Live has been authorized, close Live. Now, we'll need to locate the Unlock.cfg file from the admin user account. Then, Live's Unlock.cfg file needs to be copied from its original location and saved into a shared location, so that each user/profile on the machine has reading permission. Once configured, Live will look for unlock information in the shared location, which we'll create later. Note: The locations above might be hidden by default. This article explains how to access hidden folders on Windows and Mac OS X. Note: The x's in the folder paths mentioned above, (i.e Live x.x.x) are placeholders. On your system, the name of the this folder will reflect the version of Live you have installed (i.e. Live 10.0.1). Windows XP (for legacy versions): C:\Documents and Settings\All Users\Application Data\Ableton\CommonConfiguration\Live x.x.x\Unlock\). Note: These folders don't exist by default. Instead, they need to be created manually. Additionally, these folders and file names are case sensitive and will not work properly unless typed correctly. Recall that the x's are simply placeholders, please ensure that the folder path you create matches the version of Live currently installed. 2.2.3 Paste the Unlock.cfg file in the shared Unlock folder that you created in the step above. In order for Live to recognize and accept the Unlock.cfg in the shared folder, delete the Unlock folder in the default location after pasting the Unlock.cfg into the shared folder (see 2.2.1). The steps above take care of authorizing Live for all users on a single machine. If you need to authorize Live on multiple machines in a lab environment, you will need to repeat steps 2.2.1 - 2.2.3 for each remaining machine. So, please proceed with installing Live on all of your machines. Since authorization information stored in the Unlock.cfg file is unique for every machine, it is difficult to routinely wipe client machines and restore from a central place (i.e using a disk image). To make this process easier, you can copy the master Unlock.cfg file to a portable storage device and use it to authorize each machine (i.e USB stick or External Hard Drive). In section 2.1, we authorized Live on the classroom's administrator computer. Log onto this machine, locate the Unlock.cfg (in the default location, see 2.2.1) and copy it to your USB stick or other portable storage device. Then, log onto a client machine and paste the master Unlock.cfg (from your portable storage device) into the default Unlock folder (not the shared folder created in 2.2.2) in that machine's administrator user profile. Then, authorize Live online. Repeat this process across all client machines. At this point, we have authorized Live on each administrator user profile across all machines in the lab/classroom. Now, we'll need to allow all users/profiles on each machine to use Live as well. To do this, create a shared Unlock folder as previously discussed in section 2.2.2, on each machine. Then, copy the master Unlock.cfg (from the default location) to the shared location we created manually. Once this step is complete, go ahead and delete the Unlock.cfg from the default location. Note: If an unlock file (Unlock.cfg) already exists in the shared location of a client machine, copying the master Unlock.cfg (from the USB stick) to that machine's administrator user location will not work as expected. If this is the case, please delete the Unlock.cfg from the shared location (see 2.2.2) and begin from step 2.2.1. Note: Keep a copy of the master unlock file on a portable storage device, so you can wipe and re-install client machines without having to request more unlocks or repeat the process of unlocking on every single machine. Note: These folders don't exist by default. They need to be created manually, as you did in section 2.2.2. Folders and file names are case sensitive and will not work properly unless typed correctly. Larger labs will benefit from the integration of a third party key-server solution called Sassafras, which allows for easier license management. Please refer to the following article on how to set up Live with Sassafras. Live's Content Library consists of the Core Library, Ableton Live Packs, and the User Library. Live Packs are quite large and should exist only once on a single machine, so that they can be shared by all users on that computer. Packs should not be installed multiple times on each individual user account on the machine, as this would take up a lot of hard drive space. • From Live's Preferences > Library tab, set the installation folder for Packs to a shared, non-roaming location on the computer. Then, download and install your Ableton Live Packs. • Quit Live and make the shared Ableton Live Packs folder read-only, so non-Admin users can't install or uninstall packs. • Move the file titled Library.cfg (found in the user preferences) to the shared preferences folder (see 2.2.5). This way, information about the Ableton Live Packs you just installed will automatically be available to all users. Because we previously enabled Factory Packs to be accessible for all users (see 3.2), the Library.cfg is now stored in the shared preferences folder on the administrator's user profile. To ensure that each user has his/her own User Library, the folder path needs to be set up with a wildcard. If the specified folder doesn't exist yet, it will be created when a user runs Live for the first time. Live keeps user-specific information in default locations (see the Appendix), this includes the central Live database, caches, and Live's temporary folder for unsaved recordings. Setting all of these to non-roaming/non-network locations is strongly recommended. The Live database should never be located in a network location, since this may influence performance drastically, or even lead to database corruption errors. Therefore, add the following entries to your Options.txt file in the shared preferences (see 2.2.5). While these example entries will work, you can change the file paths to another location if you prefer. Note: These folders must be created per user. To achieve this, use the placeholder “%%USERNAME%%”. The directory containing user specific folders must be readable and writable, otherwise no sub-folders for non-admin users can be created. When you initially launch Live, files are generated so you can use ReWire (a software protocol developed by Propellerhead which allows for remote control and data transfer among DAWs). Both installations require admin rights. Note: Only the last launched version of Live can be used as a ReWire Device. If you have several versions of Live installed on your system (e.g. Live 8 and 9, or Intro and Suite), the user will be prompted with a dialog requesting an admin password during startup whenever a different version is started. To disable this prompt, add “-DontAskForAdminRights” to the Options.txt in the shared preferences (see 2.2.5). Note: When launching Live for the first time, the Options.txt above will not suppress administrator permissions requests when Live initially communicates with Max for Live. Example of file locations for user “alex” and Live 10.0.1. Learn more about the Options.txt file for Live.